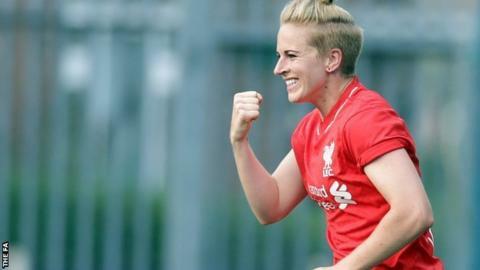 Natasha Dowie scored both goals as Liverpool, in sixth spot, moved eight points clear of Women's Super League One bottom side Bristol Academy. The striker opened the scoring early on, tapping in at the back post after goalkeeper Mary Earps had palmed away Ashley Hodson's initial cross. Hodson was the provider again in the second half, crossing from the right for Dowie to calmly slot home. In response, Sophie Ingle had an effort cleared off the line by Becky Easton. Bristol's Christie Murray twice threatened for the visitors but both her powerful effort from inside the box and long-range shot were saved by Liverpool goalkeeper Libby Stout either side of the break. Victory ensured Liverpool claimed back-to-back wins for the first time this season, while Bristol remain bottom of the WSL1 table, one point adrift of seventh place Birmingham, who host Sunderland on Sunday. Liverpool Ladies: Stout, Harris, Bonner, Longhurst (Murray 45), Dowie (Smorsgard 79), Easton, White, Zelem, Pacheco, Hodson, Staniforth (Omarsdottir 59). Substitutes not used: Derbyshire, Ryland, Green, Dale. Bristol Academy: Earps, Townsend (Lawrence 64), Weir, Ladd, Murray, Jade, Ingle, Brummel, James, Evans (Passariello 79), Short (Pinto 45). Substitutes not used: Reid, Popadinova, Brown, Bird.